Speaking of the pretty candy shell, there is something you should know about the M&M’s Premiums line. The fabled hard candy shell that coats the M&M’s we know and love is not present in these candies. Sacrilege, you cry! M&M’s without a hard candy shell!? How did this happen? How can this be?! Believe it or not, you might not miss the original candy shell as much as you think. In the Premiums line, the candy shell provides a different texture than the cracked-sugar taste of an original M&M – here, the shells are softer, giving the candies a creamier, smoother texture. 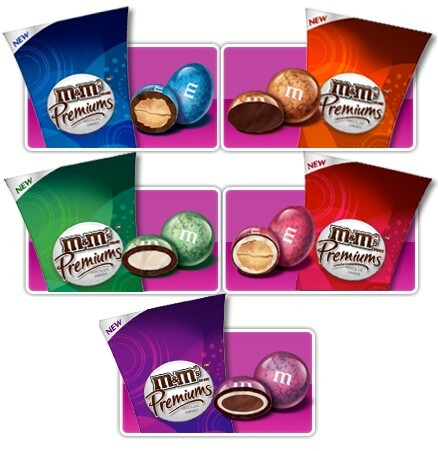 With the multi-layered flavors that comprise each Premium M&M, the softer shell allows for a more flavorful candy experience – where the original shell provides that fantastic textural sensation and sugary snap we all love, the Premium shell melts into the rest of the candy, creating a richer texture overall. There are currently five different flavors of M&M’s Premiums: Chocolate Almond, Mocha, Raspberry Almond, Mint, and Triple Chocolate. Chocolate Almond: Peanut M&M’s are one of my favorite candies on the face of the earth, so I was especially excited to try the Chocolate Almond Premiums. Coated in a shell of brilliant royal blue, the Chocolate Almond Premiums are quite pleasing to the eye – and even more pleasing to the mouth. The almond center of each M&M tasted nice and fresh, with a sharp roasted flavor that contrasts nicely with the sweet, smooth milk chocolate that coats each nut. They are similar to Peanut M&M’s in size and texture, but the almond center gives the candy a richer, deeper flavor, and the thinner shell allows for a more chocolaty, denser chew than one would find in the originals. I still prefer the Dark Chocolate Peanut M&M’s, but the Chocolate Almond Premiums are a welcome alternative. Mocha: The Mocha Premiums are exceptionally good – the coffee flavor is strong without being overpowering, which allows the creaminess of the milk chocolate to blend nicely with the snap of the coffee, creating a smooth, rich taste akin to a Starbucks Mocha Frappucino. I was incredibly surprised at how much I loved the Mocha Premiums. And an added bonus – their outer shell is a lovely shade of copper, which is about as close to resurrecting my beloved tan M&M’s as I’m going to get. Raspberry Almond: I was hesitant to try the Raspberry Almond, after my disappointing experience with Razzberry M&M’s last winter, but the issues I had with the Razzberry M&M’s seem to have been dealt with here: the raspberry flavor of the Premiums is much more natural than that of the Razzberry predecessor, and the roasted flavor of the almonds balances out the sweetness of the chocolate and the raspberry coating. I have to admit that these were still my least favorite of the bunch, but perhaps they would make a good addition to a trail mix – kept cold, of course! Mint: The softness of the Premium shell lends itself especially well to the Mint variety, as the dark chocolate shell melts right into the minty, white chocolate center. The smoothness of both the white and the dark chocolate are complemented perfectly by just the right amount of mint, giving the M&M’s a soft, creamy texture similar to peppermint patties and a taste reminiscent of mint chocolate chip ice cream. Out of the five Premiums, the Mint has the best potential for use in baking. I can easily see them used as a delicious addition to brownies, cookies, and even as a topping on ice cream sundaes. Triple Chocolate: My absolute favorite M&M’s in the new Premium line have to be the Triple Chocolate Premiums. As the name implies, three types of chocolate make up these delicious little treats: the shimmering purple shell, made from a layer of dark chocolate, encompasses a thin layer of white chocolate, which, in turn, surrounds a creamy milk chocolate center. I was extremely impressed by these M&M’s – I didn’t expect to be able to taste all three chocolates as they melted away in my mouth – particularly the white chocolate layer, which is subtle at first but strengthens as the milk and dark chocolates begin to blend together, providing an unexpected, creamy sweetness. It’s exactly what the line should be: they still taste like M&M’s, only amped up to a higher level, with a more complex flavor brought on by a quality blend of three premium chocolates. M&M’s Premiums may not be the M&M’s we’re all used to, but trust me, they are truly a welcome edition to the M&M’s family. They’re lovely on the outside and even better beneath the shell. AWESOME! Where can I find them!? Wal-Mart (*erk*)? Target? How big is each box? How many ounces? I just picked-up a box of the triple chocolate at my local CVS and they are fantastic! They remind me of the special edition Kershey Kisses Trio’s, which I miss to this day. I just wish these new M&M’s were cheaper. At $4.99 a box, they hurt my wallet more than my hips. I found them all at my local Fred Meyer (in their gourmet chocolate section). Currently on sale this week for $3.50 each (or as they say “2 for $7.00″). Each box is 6 ounces (170.1 grams), about 920 – 960 calories a box. So far, I opened the Raspberry Almond… incorrectly (zip-lock is my friend). Note: Look for where the bag says “open here,” and don’t go tearing into it while you drive… Do it BEFORE you start the car (*damn addiction*). I haven’t checked to see if they melt in my hand yet, but they feel like they will…. pretty fast. Be careful, don’t leave these in the car on a warm or sunny day. I opened the rest correctly and had a few of each. MMmmmmmm, they are all good. Those mint ones are TOTALLY mint chocolate chip ice cream! DAMN good. Okay it’s official. I need to find these. I’ve had mint m&ms before but the other flavors sound flat out amazing. Yay! I mean I’m an insane (literaly) candy addict anyway, again I say yay. Finally, I’ve found someone who shares my tan M&Ms withdrawal! I thought these were good but I think I would have liked the old candy shell better. Well, I know what *I* am taking to “Dark Knight” in my purse. Fingers crossed they have them at my CVS. I saw these at the store last night. And I want them really, really badly. Mmmmm…. I picked up chocolate almond and white chocolate mint PM&M’s at Walgreen’s. They were on sale with an in store coupon, 2 for $5. Great deal. CAn anyone tell me how many pieces are in one packet? I am thinking of using them as baby shower favors but needed an estimate in how many boxes I would need to buy. The pink rasberry ones would go great with the theme but now I am worried about flavor. I might have to buy one and check it out myself. I tried the mocha version and they are chewy and GROSS! Anyone typing on how delicious these are is not a true chocolate devotee…I am more interested in cocoa content than a shiny shell and sugar content. I was very disappointed. I think the best M&M’s have been the dark chocolate peanut ones, kept in the fridge! Otherwise the sugar content of M&M’s is not worth consuming them. are the premium chocolates found in singapore currently? I bought a box of the Triple Chocolate ones because of your review and I have to say they are AMAZING!! I bought them at Target for $3.50 and they were worth every penny. This morning I woke up to discover that most of them were gone, thanks to my roommates. Excellent review. OMG it sounds so good!